Analysis: In his return from a three-game absence in Sunday's 29-27 loss to the Rams, Cobb ranked fourth in offensive snaps (24 of 52) among Packers wideouts, trailing Davante Adams (40), Marquez Valdes-Scantling (31) and Geronimo Allison (30). Cobb parlayed that usage into four catches (on five targets) for 40 yards. If he's able to increase his workload and suit up Week 9 in New England, he could take advantage of a Patriots pass defense that ranks 27th in the league (277.3 yards per game) this season. Cobb caught four passes for 40 yards in Sunday's loss to the Rams. Cobb (hamstring) is active for Sunday's game against the Rams, Michael Cohen of The Athletic reports. Cobb (hamstring), who is listed as questionable for Sunday's game against the Rams, is expected to play, Ian Rapoport of NFL Network reports. Cobb (hamstring) was a full practice participant Friday but is listed as questionable for Sunday's game against the Rams, Michael Cohen of The Athletic reports. Analysis: Despite the official designation, Cobb's ability to make it through a full practice supports coach Mike McCarthy's stated expectation that the veteran slot receiver will return. With Geronimo Allison cleared from the final injury report, Aaron Rodgers will have his full complement of pass-catching weapons for the first time since Week 3. Cobb draws a tricky matchup against Rams slot corner Nickell Robey-Coleman. Head coach Mike McCarthy said Thursday that Cobb (hamstring) is "on course to play" in Sunday's game against the Rams. Analysis: Cobb was limited in Wednesday's practice, but head coach McCarthy appears to have liked what he saw out of the wideout during the session. Cobb still has some work to do before he is fully cleared, but McCarthy has very little doubt surrounding the status of Cobb and fellow wideout Geronimo Allison (hamstring). Expect Cobb's status for this weekend to be confirmed in the next day or two. Cobb (hamstring) was limited at Wednesday's practice, Michael Cohen of The Athletic reports. Analysis: It's been exactly one month since Cobb last logged any game action, the result of a lingering hamstring injury. Until he progresses to a full session, his availability will be difficult to peg down, as he often was listed as limited in injury reports prior to the Packers' Week 7 bye. 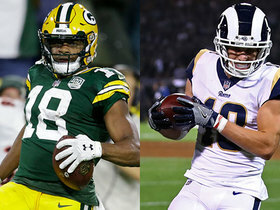 If he's absent again for Sunday's road game against the Rams, Cobb likely would yield snaps to the trio of rookie wideouts (Marquez Valdes-Scantling, Equanimeous St. Brown (knee) and J'Mon Moore) on the roster. Cobb (hamstring) is participating in Tuesday's practice, Ryan Wood of the Green Bay Press-Gazette reports. Cobb (hamstring) is listed as inactive Monday against the 49ers, Jason Wahlers of the Packers' official site reports. Analysis: With a Week 7 bye upcoming for the Packers, Cobb and Geronimo Allison will be held out as a result of their respective hamstring injuries. For the second consecutive game, Aaron Rodgers will be working with Davante Adams and a trio of rookie wide receivers (Marquez Valdes-Scantling, Equanimeous St. Brown and J'Mon Moore). Cobb (hamstring) will be inactive Monday night against the 49ers, Tom Pelissero of NFL.com reports. Analysis: Cobb won't officially be deemed inactive until the Packers release their list of scratches for Monday's contest, but it was reported earlier Monday that Cobb was not expected to play, and this report brings that closer to fruition. Fellow receiver Geronimo Allison (hamstring) will also be inactive Monday, which puts Marquez Valdes-Scantling and Equanimeous St. Brown in line to start alongside top wideout Davante Adams. Cobb (hamstring) likely will be inactive for Monday's game against the 49ers, Adam Schefter of ESPN reports. Analysis: Likewise for Geronimo Allison (hamstring). With a bye Week 7, the Packers seemingly want to be healthy on the other side, hence the reason caution is expected to be exercised. If both Cobb and Allison are absent, it sets up a similar receiving corps to a week ago, when Marquez Valdes-Scantling, Equanimeous St. Brown and J'Mon Moore joined No. 1 wideout Davante Adams as those available to Aaron Rodgers. Cobb (hamstring) is officially listed as questionable for Monday's matchup with the 49ers, Michael Cohen of The Athletic reports. Analysis: Cobb was limited once again at Saturday's practice and considered a game-time decision Monday. He has been sidelined the last two weeks, but has voiced optimism regarding his chances to return for Week 6. 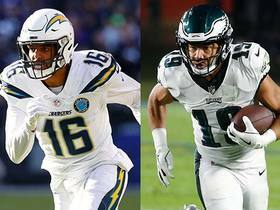 Unfortunately, the timing of the game makes it a tricky situation for fantasy owners. 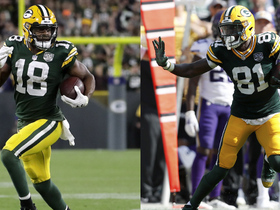 Marquez Valdes-Scantling and Equanimeous St. Brown could once again be in for big workloads if either or both of Cobb and Geronimo Allison (hamstring) are once again sidelined. Cobb (hamstring) was a limited participant in Friday's practice. Head coach Mike McCarthy said Cobb (hamstring) will work with the Packers' rehab group Friday, Michael Cohen of The Athletic reports. Analysis: McCarthy said the same thing prior to Thursday's practice and Cobb was still able to get in a limited session, so it remains to be seen what level he will participate at Friday. Any participation at all would move Cobb closer to returning to action Monday against the 49ers. Cobb (hamstring) was limited in practice Thursday, Rob Demovsky of ESPN.com reports. Cobb (hamstring) will be limited to working out with the Packers' rehab group during Thursday's practice, Rob Demovsky of ESPN.com reports. Cobb (hamstring) is hoping to return to action in Week 6 against the 49ers, Stacey Dales of NFL Network reports. Analysis: Cobb told Dales that he "really wanted to play" Sunday against the Lions, but his injury simply did not allow him to. Cobb did not practice at all leading up to the Lions game, so he will likely have to get in some work on the practice field in order to return to action in Week 6. Those with Cobb on their fantasy squads will be hoping for a final decision on his availability prior to game day, as the Packers and 49ers will not take the field until Monday night. Coach Mike McCarthy said that Cobb (hamstring) won't play Sunday against the Lions. Analysis: Cobb was unable to practice this week, so he'll miss his second game in a row as a result. Fellow receivers Davante Adams (calf) and Geronimo Allison (concussion) are also uncertain to suit up this week, so it remains to be seen exactly how the Packers' depth chart at wideout will shake out for Week 5. Cobb's absence for an additional game at least assures Marquez Valdes-Scantling another turn in the starting lineup. Cobb (hamstring) didn't take part in practice Thursday, Tom Silverstein of the Milwaukee Journal Sentinel reports. Coach Mike McCarthy said Cobb (hamstring) would work out on the side with the Packers' other injured players during Thursday's practice, Rob Demovsky of ESPN.com reports. Cobb (hamstring) didn't practice Wednesday, Michael Cohen of The Athletic reports. Coach Mike McCarthy said that Cobb (hamstring) would work out with the Packers' other injured players on a side field at practice Wednesday, Tom Silverstein of the Milwaukee Journal Sentinel reports. Cobb (hamstring) wasn't held out as a precaution during Sunday's 22-0 win against the Bills, Jim Owczarski of the Milwaukee Journal Sentinel reports. "I wouldn't have been able to play this week," Cobb said Monday. "As much as I would've wanted to, I couldn't be out there running at full speed. So it's no reason to take that risk." 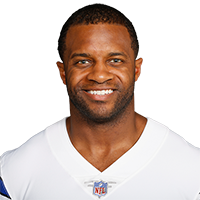 Cobb (hamstring) is inactive for Sunday's game against Buffalo, Rob Demovsky of ESPN.com reports. Analysis: Cobb was a limited participant in practice Thursday and a non-participant Friday. Geronimo Allison and Marquez Valdes-Scantling will be the leading candidates to take on extra snaps with Cobb out. Cobb (hamstring) was held out of practice Friday and is listed as questionable for Sunday's game against the Bills, Michael Cohen of The Athletic reports. Analysis: A mid-week addition to the injury report, Cobb was a limited participant Thursday and a non-participant Friday. Coach Mike McCarthy discussed the situation Friday morning, acknowledging the uncertainty surrounding Cobb's availability for Week 4. Geronimo Allison and Marquez Valdes-Scantling will be the leading candidates to take on extra snaps and targets if Cobb lands on the inactive list prior to Sunday's 1 PM ET kickoff. When asked about Cobb's hamstring injury Friday morning, head coach Mike McCarthy said, "We'll see what today brings. 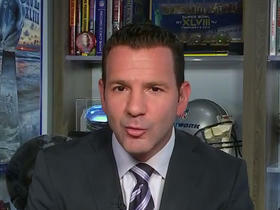 It's unfortunate, but we'll see how it goes," according to Rob Demovsky of ESPN.com. Analysis: Cobb showed up on Thursday's injury report with the hamstring injury, and McCarthy's comments indicate it could be more than just some simple soreness. What exactly that means in regards to Cobb's Week 4 availability is uncertain, but those hoping to include him in this week's lineups will want to keep tabs on his status. Cobb was limited at Thursday's practice due to a hamstring injury, Michael Cohen of The Athletic reports. Analysis: Cobb is making his first appearance on the injury report this season, but his ability to take part in individual drills indicates he's dealing with a minor concern. Still, his status will be one to monitor as the Packers prepare for Sunday's game against the Bills, who have given up 256.7 passing yards per game to date in 2018. Despite being targeted 11 times, Cobb caught just four passes for 23 yards and lost a fumble in Sunday's loss to the Redskins. Cobb caught four passes for 30 yards in Sunday's tie with the Vikings. Cobb will continue serving as the Packers' top punt returner, Zach Kruse of The Packers Wire reports. Analysis: Fellow receiver Trevor Davis was in line to serve as the Packers' top return man, but he injured his hamstring prior to the season opener and landed on injured reserve, so Cobb filled in for Davis in Week 1, and will continue doing so for the time being. This won't affect Cobb's fantasy value much, but it does give him a slight boost in leagues that count return touchdowns for the player instead of in addition to the team defense, and/or those that score return yardage. Cobb secured nine of 10 targets for 142 yards and one touchdown during Sunday's 24-23 victory over the Bears. Cobb enters the season as the Packers' No. 2 receiver behind Davante Adams despite rumors that he was on the trade block in August. Analysis: The Packers were very careful with the members of their first-team offense this preseason, which left Cobb with only a small handful of snaps along the way. After a delayed start to training camp following surgery to remove cartilage from his right ankle, Cobb appears to be healthy as Green Bay's Week 1 matchup with Chicago draws closer, but it will be interesting to see if that issue resurfaces and limits his availability or productivity as the season progresses. Cobb (ankle) failed to come up with his only target in the Packers' 51-34 preseason win over the Steelers on Thursday. Analysis: The good news was that the veteran made his preseason debut, although he wasn't in for long. 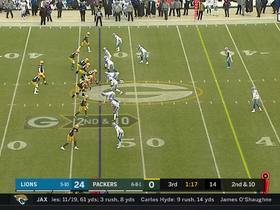 Cobb's sole target came on the Packers' first offensive possession, when Aaron Rodgers attempted to hit him with a short pass on the right side of the field. His first taste of game action out of the way, he'll look to up his playing time and production in the Packers' "dress rehearsal" game versus the Raiders a week from Friday. Cobb (ankle) is suited up for Thursday's preseason contest against the Steelers, Rob Demovsky of ESPN.com reports. Analysis: Cobb got a delayed start to training camp due to his recovery from surgery in mid-June to remove cartilage from his right ankle. He subsequently missed the Packers' preseason opener, but he may have increased his practice reps enough in the intervening week to join Aaron Rodgers for his (likely) sole series Thursday. Cobb (ankle) took the practice field in pads Sunday, Wes Hodkiewicz of the Packers' official site reports. Analysis: The activity marks Cobb's first in nearly a week due to recurring issues with the right ankle that required surgery after the offseason program. There's no telling how much work he'll fit in Sunday, but he's seemingly on track to make an appearance in the Packers' second preseason game Thursday versus the Steelers. Cobb (ankle) did not play in Thursday's preseason opener. Analysis: Cobb has dealt with a nagging ankle injury of late, so it probably was not too hard a decision to hold him out of Thursday's contest. Cobb is still expected to be ready for Week 1, and will be in the starting lineup as long as he is available. Cobb (ankle) was held out of Tuesday's practice, Ryan Wood of the Green Bay Press-Gazette reports. Analysis: Cobb has been in and out of practice throughout training camp in an attempt to limit soreness in the ankle that required mid-June surgery to remove cartilage. He'll presumably be held out of Thursday's exhibition opener against the Titans, but he could still make an appearance at some point during the preseason. Cobb (ankle) returned to practice Monday, Ryan Wood of the Green Bay Press-Gazette reports. Cobb is downplaying a right ankle issue that led to him sitting out Saturday's practice, ESPN's Rob Demovsky reports. "We're just managing the soreness right now, but it's not a big [concern]," Cobb noted afterward. Analysis: Though the wideout isn't overly concerned about the issue, it's worth noting that Cobb had a procedure on the same ankle earlier this summer in order to remove cartilage. Once he's back on the field, Cobb will continue to see first-team reps along with Davante Adams, an arrangement cemented by the offseason departure of Jordy Nelson. Cobb, who underwent surgery six weeks ago, did not require an invasive procedure and simply needed nagging cartilage removed from his ankle, Michael Cohen of The Athletic Wisconsin reports. Analysis: Cobb was seen sporting a walking boot in airport last month, raising concern over the receiver's health status in advance of training camp. However, it sounds like the issue was never anything serious, or that has the potential to resurface later in this year. With procedure behind him, Cobb has been practicing with the first-team offense during the opening days of training camp, and that's highly unlikely to change anytime soon. Cobb (foot) practiced with the first-team offense Thursday, Michael Cohen of The Athletic Wisconsin reports. Analysis: In late June, Cobb was spotted with a walking boot on his right foot, spurring speculation about his health. Neither the player nor team elaborated on the nature of the injury, and his presence on the practice field to start training camp seems to have alleviated any prior concerns. Rob Demovsky of ESPN.com further relayed that Cobb was running at full capacity Thursday, so he can safely settle into the No. 2 wide receiver gig bequeathed to him when the Packers released Jordy Nelson in March. Cobb (foot) was spotted without a walking boot during his annual youth football camp Wednesday, Chris Roth of WBAY Green Bay reports. 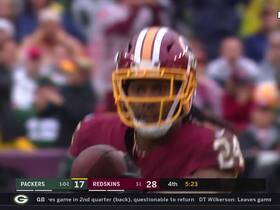 Cobb (foot) plans to be involved during training camp and isn't sure if he will have any restrictions, Chris Barriere of NBC 26 Green Bay reports. Cobb has a walking boot on his right foot and may be eased into training camp, but there's no concern about his Week 1 availability, Michael Cohen of the Milwaukee Journal Sentinel reports. Cobb likely is part of the Packers' plans for 2018 after the team released Jordy Nelson on Tuesday, ESPN.com's Rob Demovsky reports. 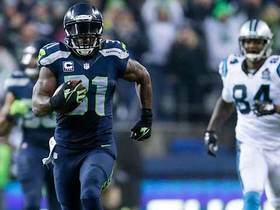 Analysis: Seeking cap space to sign Jimmy Graham, the Packers unsurprisingly stuck with 27-year-old Cobb over 32-year-old Nelson. The veteran slot receiver hasn't sniffed the 1,000-yard mark since signing a four-year, $40 million contract in 2015, but he's maintained a catch rate in the 70-percent range while showing flashes of his top form. There's still potential for another big season if Cobb and Aaron Rodgers can actually stay healthy at the same time for an extended period. Packers general manager Brian Gutekunst hinted at a preference for keeping Cobb with the team, Wes Hodkiewicz of the Packers' official website reports. Cobb nabbed four of six targets for 45 yards and a touchdown during Sunday's 35-11 loss to Detroit. He added a four-yard run during the contest. Cobb caught four of seven targets for 22 yards Saturday against the Vikings. He also lost six yards on his lone carry of the 16-0 defeat. Cobb may pick up extra snaps and targets with Davante Adams (concussion) ruled out for Saturday's game against the Vikings, Wes Hodkiewicz of the Packers' official site reports. Cobb brought in seven of 14 targets for 84 yards and a touchdown in Sunday's 31-24 loss to the Panthers. Cobb caught all eight of his targets for 39 yards in Sunday's 27-21 overtime win in Cleveland. 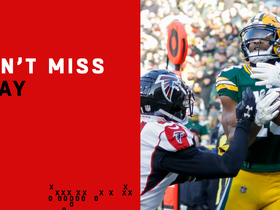 Analysis: After going without a target the previous week, Cobb finished second to only Davante Adams (14) on Sunday but was forced to settle for short gains besides one 16-yard pickup. Yet to top 60 yards with Brett Hundley under center, Cobb would get a boost if Aaron Rodgers (collarbone) were to return for Week 15 in Carolina. Cobb averaged 5.8 catches for 54.5 yards on 7.8 targets in the four games they played together earlier this year. 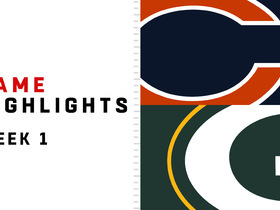 Cobb was not targeted in Sunday's 26-20 overtime victory against the Buccaneers. Cobb caught four passes for 58 yards and a touchdown in Sunday's loss to the Steelers. Cobb had three receptions for 34 yards and one carry for no yards in Sunday's 23-0 loss to the Ravens. Cobb caught three of four targets for 52 yards and added eight yards on four carries during Sunday's 23-16 win over Chicago. Cobb caught all five of his targets for 58 yards in Monday night's 30-17 loss to the Lions. Analysis: Cobb provided the Packers' longest offensive play of the night, turning a short toss into a 46-yard gain during the fourth quarter. Although that play helped Cobb lead Green Bay in yardage, and he hauled in each of his other four targets, quarterback Brett Hundley's limitations vertically again restricted the production of his receivers. With another week to work with Hundley, Cobb and company will hope Week 10's meeting with the Bears brings more chunk-play opportunities.